Our choice of a final meal before exile in Queensland (Christmas holidays) is Thuy Huong Coffee Lounge in Marrickville. I love asking Marrickville residents and regulars which is their favourite Vietnamese hole in the wall restaurant. Everybody has a different answer. I find it impossible to name a favourite but for daytime dining Thuy Huong is often first pick. It has an airy corner location that catches breeze, it's a fine place to sit and watch the world go by. Also the food is always good. Perhaps some other joints may do this or that dish a bit better, and cheaper, but Thuy Huong is always pretty darn good across the whole menu. Plus we love the family that runs the place, even the grumpy lady in the hat. Bun Cha Ca - Vermicelli Soup with Fish Cakes and Betel Leaves - $14. This is sensational. It has fresh earthy herbal kind of flavour. The soup also comes with those lovely pork morsels wrapped in green stuff. Oh yeah. Crab pattie vermicilli soup. Almost as nice as the Bun Cha Ca. I love the way the pattie breaks up like mince so you get some in every mouthful. $14. Heavenly. Alison describes her Bun Cha Ca as a forest of flavour, whereas my crabbie pattie number is more a primordial soup. These are probably our all time favourite Vietnamese dishes. 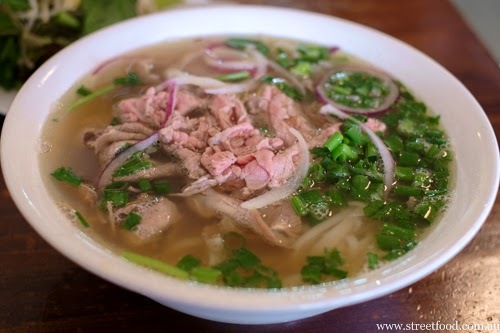 We also enjoy them immensely (and cheaper) at Pho Hanoi Quan down the road. Thuy Huong Coffee Lounge Menu - click to enlarge. The printed menu has many more dishes. Thuy Huong Coffee Lounge is at 252 Illawarra Rd, near the corner of Marrickville Road. It's probably the priciest of the Marrickville hole-in-the-wall Vietnamese joints, depending on what you fancy, but we don't care, we love it. Alas the building is getting renovated and Thuy Huong move a few doors down to number 304 as of September 2012. We will sorely miss this lovely space. Thuy Huong's new premises at 304 Illawarra are slightly more flash but we sure miss the the magic airy corner space they had at the old shop. On the upside the kitchen is now open so you can watch the show, we're sure the chefs must be happier too. When we visited the restaurant was jam packed but we still got our meals within ten minutes. These guys are pros. We try our old Thuy Huong favourites, they are still great. 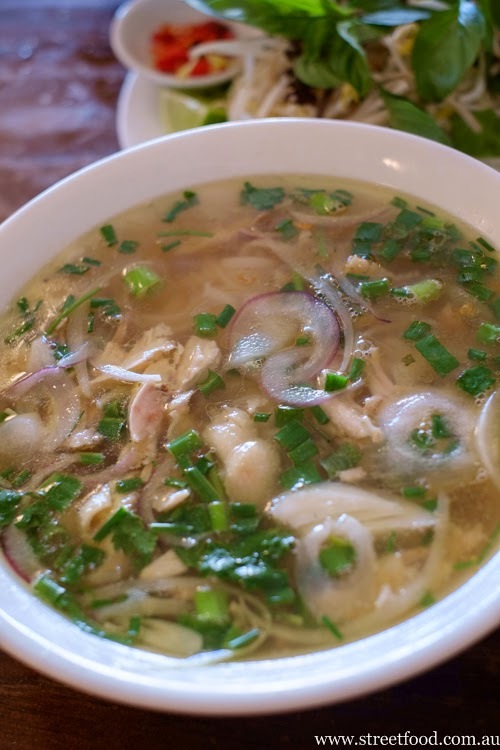 Pho gai - chicken soup - about $10. A real chicken-y broth with scatterings of chook flesh and sliced onions. Beef and beef brisket noodle soup - $10. Like a pho with thin slices of brisket. Thuy Huong Vietnamese Restaurant is no longer the coffee lounge it never was, and is now at 304 Illawarra Road Marrickville. I've never had betel leaves but they are on my hit list! I was there yesterday, it is a bit of a fave of mine, however I deviated and had the pancake and there are better around. I have been there a couple of times years ago. I would love to try the oxtail soup! Is Thuy Huong in Glebe a branch of the original in Marrickville?